First, they posted a music video “We’re all riding in our minivan” from the Tim and Eric show, jokingly claiming that it was their new album. 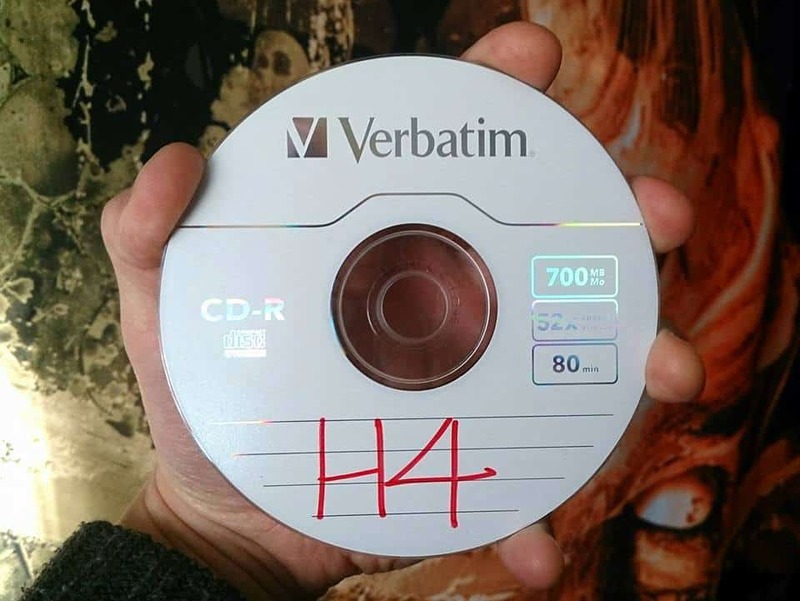 Second, they posted a picture of them holding a Verbatim CD-R with H4 written on it. Stating “Oh, sorry! We didn’t even tell you what our new album’s called! 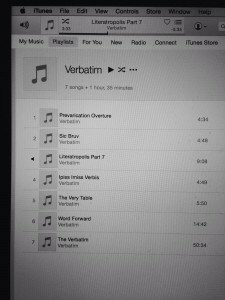 Please welcome ‘Verbatim’, our fourth album. And here’s the first copy!” And third, they posted a screenshot of iTunes with the album Verbatim playing with fake track names and track lengths (With a total run-time that would in fact, not fit on a standard Verbatim CD-R). This picture was accompanied by the activity “Playing troll.” Looking at the track times in that picture and comparing them to the actual album, a lot of them match up. Initiate = Prevarication Overture, 1985 = Literatropolis Part 7, The Architect = Word Forward, Earthrise or Lapse = Sic Bruv or Ipiss Imiss Verbis, The Endless Knot = The Very Table. No idea what the 50 minute 34 second song The Verbatim is supposed to be, it would be interesting to hear what that actually was! The comments on those posts were entertaining as well, click the images below for the direct links to the posts. Later on when their new website launched “verbatim” was the password used in a fake unix console to access the real album announcement and trailer (in the second version the password automatically entered itself, for those who didn’t get the joke). It’s always nice to see bands not take themselves too seriously and have fun with their fans. Now let’s get to the content of the album. Affinity starts off with the track ‘affinity.exe’ which is a minute and a half of atmospheric sound effects and indecipherable voices. At first the sounds appear to be random, but the beeping at the beginning is actually Morse code, which translates to a repeating “AFFINITY HAKEN 1985”. Also, If you take a look at the spectral frequency waveform of the track, and zoom in at the highest resolution, you can some interesting shapes hidden within the frequency, the most recognizable ones resembling the shape of the letter A (for Affinity i’m sure). The track then fades into keyboard riff that leads into the first full song Initiate. This is the first single that the band released as a music video before the album’s release. 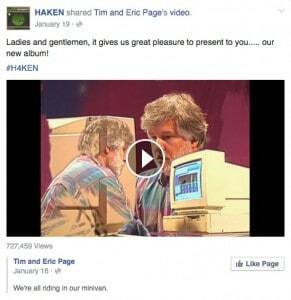 ‘Initiate’ is a pretty straightforward Haken song. It has great driving riffs and smooth layered vocals, with some softer moments to break it up. Although it’s not quite indicative of the overall sound of the album, it’s definitely a familiar sound to fans of the band, and a solid opener. Next we have ‘1985’, which is a bit longer, clocking in at 9:09. This song is a bit more keyboard driven, and uses synth sounds inspired by the 80’s (as its title suggests). The solos that start at around 5:45 really have an 80’s feel to them. The band stated that as The Mountain was a 70’s inspired album, Affinity is an 80’s inspired album. It’s definitely an interesting choice, and although the style may not appeal to everyone, Haken certainly make it their own. I’m interested to hear what decade they decide to take inspiration from on their next album. Lapse is another pretty straightforward song with some great solos in the middle backed by some solid bass playing by the newest member Conner Green. This song has a really nice groove. Next we have the 15-minute ‘The Architect.’ The intro to this song has great buildup into some chugging riffs, switching back and forth between softer and heavier passages, in true prog fashion. 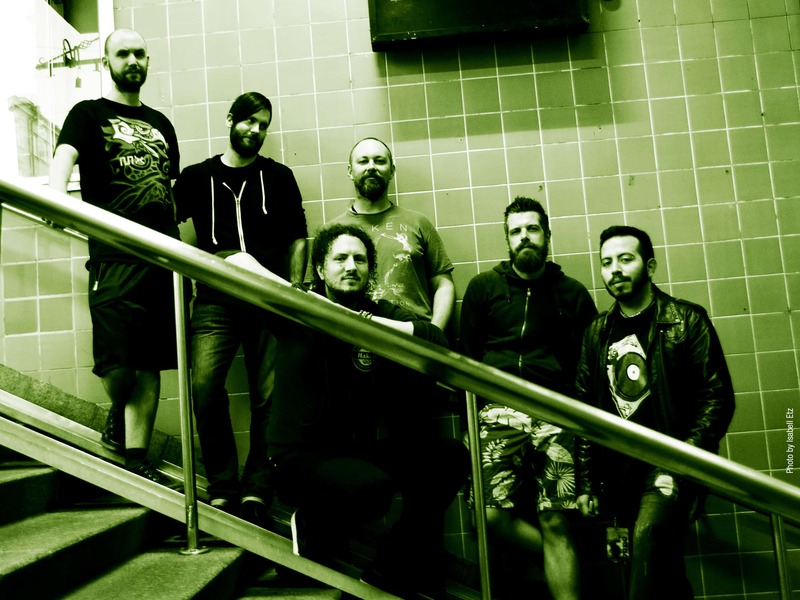 The main chorus repeats a few times before switching to an atmospheric section that builds up into a keyboard and guitar solo followed by guest vocals by Leprous vocalist Einar Solberg in his Norwegian Black Metal style. The rest of the track remains heavy with some dark synth and guitar sounds drawing on the tone the harsh vocals set. The musicianship is excellent all around on this track. The chorus plays one last time to bring this epic track to a close, ending with the chugging riffs backed by a cinematic choir. ‘Earthrise’ is a bit of a change of pace for the album, with a very soft poppy vibe to it that fully embraces the 80’s influence sounding almost like an 80’s pop song. I really enjoyed the vocal melodies and harmonies in this one. The song also plays with some interesting guitar sounds too, especially the clean strumming part during the lyrics “Two steps back, one leap forward.” While some of the other songs with their complexity took a few listens to fully appreciate, this song I got into immediately with its catchy vocals and rhythm. ‘Red Giant’ is a softer atmospheric song with the vocals using an echo effect that pairs well with the arrhythmic drumming. While one of the more simplistic songs on the album, it definitely has some depth to it. ‘The Endless Knot’ starts out with a nasty keyboard riff which is then accompanied by some djent guitars. After a few melodic passages the keyboard returns with an even heavier sound turning into dubstep while battling the djent guitars. Then a melodic guitar solo comes out of nowhere. This is an especially cool song with how contrasting its different sections are. The final track, ‘Bound By Gravity,’ begins with some soft soothing piano and acoustic guitar that builds up into a really deep sound. This is a song I can’t wait to listen to on vinyl to hear all the intricacies of the backing tracks. It gets really quiet at the 5:15 mark where the piano and guitar are singled out for a few seconds before the vocals join back in and then the rest of the backing tracks, building up into a grand finale. While not as heavy as other parts of the album, the fullness of this track gives it a theatrical ending which closes off the album beautifully. After the ending, a minute of ‘affinity.exe’ plays again, as the Affinity program shuts down. A nice touch, but not completely necessary. Haken take their sound many new places on this album, and overall they succeed in creating another great prog album. While not all of the sounds and styles explored on this album will appeal to everyone, namely fans of the band’s earlier work, it’s definitely worth checking out. It doesn’t quite stand up to The Mountain in my opinion, but parts of this album come close, and showcase the creativity of a band not afraid to try something new. A press copy of this album was provided for this review.